Congratulations for well deserved award. just WONDERFUL! magic light, magic atmosphere..great crop..perfect!! Fantastic! Wonderful composition with the S of the water and the dark tree leaning in on the left to cover the plain background of smaller trees. the light threw a golden coat on the tree and wounding river.Very beautiful! Ohhhh, This is one of these shots that just jump out at you. You know when you see it, it's georgous. The perfect light, the perfect place and the perfect shot. Great work! Added to my favorites, thanks. breathtaking photo. great colors, they really make the scene. WOOOW! amazing shot!!!!!! Fantastic lighting!!!!!!! Now you know why I love this photo don't you...? And I'm not even talking about the fact that it's "refreshingly" romantic and dreamy! Wooowwww, goes to my favorite!!! this is a real excellent description of winter as we have it in central europe. so strong is the photo that i mean to feel the cold air blowing through the forest. phantastic work. congratulations! i am deeply flattered by your comparison in your comment on 'sunny entry'. thank you very much! Beautiful winter scene. Excellent composition and nice mood. 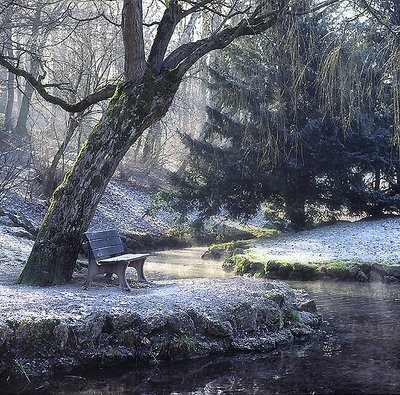 What a wonderful winter scene in an excellent photo Jan, love the composition,very well done. Very good! It even looks cold! Strange why some trees are inclined but most of them are vertical. Truly an outstanding tranquil capture, very masterfully done, love this. WOW!!!! Jan!!! Wonderful!!!! What light! I don't have words to say what I feel!!! Nice texture and nice atmosphere! !Merry christmas!! this is just sooo beautiful..
romance so thick in this..i can imagine sitting with someone special cuddling up to keep warm. rosy cheeks bright eyes..ahh yes love is in the air. Jan, this is stunning! It looks just like a painting, and the light is incredible!!!!!! Very well done!! Great composition, lighting and colours. Very very beautiful photo! Composition is just soooo perfect, I really LOVE the way you composed it! And the lighter tones in the background really kind of lifts out the foreground which adds a wonderful depth. Also, it looks like very very soft mist or "smoke" or what it's called in english, coming up from the water! Wonderul!! Great composition, excellent execution! Outstanding colors and perfect lighting. What a great capture here... Bravo for sure ! ! ! This is a really great composition Jan. I love the use of subdued Winter colours and the way the water takes the eye through the image. One for my favourites. Thank you very much for your kind comments on my, "End Of The Line". Perfect square beauty! Excellent exposure in difficult condidtion of the light.Oh! Jan, this is a beautiful shot and almost looks as if it could be a painting. great job! regards, marie c.
Great composition, lighting and details, and subtle colors. But above all, it's the peaceful mood of this scene that makes it all. Ausgezeichnet!!! Ales ist ruhig. Wirklich Winter Idyll. Beautiful and well composed winterlandscape.Definition and colorare over all excellent. This photo is so beautiful, with very nice atmosphere. Delight in being alone.Enjoy being alones as much as feasible, as much as practical. Brilliant work, Jan. Excellent composition and fantastic lighting. Congrats... Günter. Excellent composition captured with a perfect exposure choice that enhances the magical mood of this moment. Congrats! My best regards and wishes for a merry, merry Christmas. Jan, wat heb je er een schitterend Plaatje van gemaakt. another masterpiece Jan, wonderful capture. Fantastic composition and toning. The square format, curve of the stream, and angle of the tree combime perfectly to create a highly succesfull image. One of your best and going in my favorites. dear jan, salam, you have done excellent work here, as always, very cold scene, but yet so beautiful and calm that you could sit for hours and enjoy the splended place and a bit of green color has great emotional effect and gives life to coldness of place. added to my favorites. dar entezar aks hay bishtar! This place is a paradise! It makes well to the eyes. Fantastic place, perfect work! Je weet die plekjes wel te vinden.. Weer een prachtige foto en zou het ook niet erg vinden om daar een tijdje voor me uit te zitten staren..
Beautiful! "as always" Great curve, light and framing. The composition is great. The empty bench seems to be inviting the viewer to sit down for a rest. I especially like the green foilage along the stream bank, it lends a hint of color to an otherwise stark image. I love your city and I try to visit Munich often. Composizione grandiosa! Ottimo il forte contrasto e ben equilibrati i toni. Eccellente foto ) ! La luce poi è stupenda!